Dragon Ball Super: Episode 18 "I'm Here, Too! Training Commences on Beerus' World" Review – AiPT! After realizing that Vegeta had been training with Whis for the last six months, Goku immediately wanted to get some of that too. So we left the last episode with Goku flying off clutching Whis’s leg in the hopes that he will be trained too. The episode starts where the last one left off, with Goku and Whis traveling back to Beerus’ planet. And to get things going in the right direction, we start the episode off with potty humor. Goku needs to pee so there is a rather extended conversation about how he can’t do that in space. Anyway, they arrive at Beerus’ planet and Vegeta appears to be waiting for them. Vegeta has been acting as a steward, complete with apron, while Whis was away on Earth. With the arrival of Goku, a verbal sparring match commenced, with the nugget dropped that that Vegeta may indeed be stronger then Goku now. While Vegeta was training, Beerus has been asleep and part of Vegeta’s job while under Whis’ tutelage has been to make sure he stays asleep. 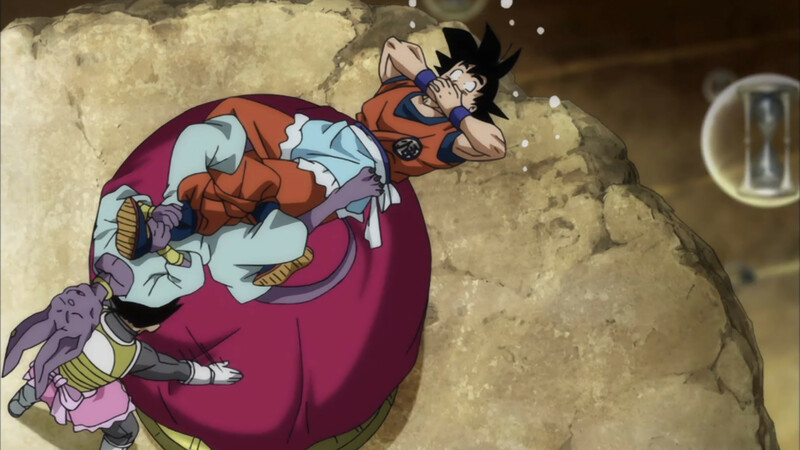 So, Goku joins in the “fun” and the first job…changing Beerus’ sheets without waking him. While Goku and Vegeta await an opportunity to change the sheets, Beerus is tossing and turning in bed. This ends up knocking Goku into a wall and Vegeta into one of the “alarm clocks”. The alarm clocks are actually very large sand timers which explode when they go off. To prevent the one by Vegeta from going off, Goku transports it to Whis just as it explodes. When they return Goku gets grappled by Whis. While he is grappled Goku is able to lift him off of the bed. It turns out that changing the sheets was not part of the training. It was just chores. After the sheets, they proceed to mop the planet, clean the seer’s fish bowls, and cut the grass by hand. After all the chores are done, Whis gifts Goku a new gi and the training commences. The first training goal is to take a lap around the world, while carrying weights, before the pathway disappears beneath them. Apparently if they fall they will be cast into another dimension from which there is no return. During the training session Whis transports them into Beerus’ chamber where Beerus releases an uncontrolled blast during his sleep. The two just manage to dodge the blast, but not unscathed. And with that, the day of training is complete and they go to bed. As Goku falls asleep, Vegeta continues to train by lifting the same weights from earlier. While they sleep the oracle fish and Whis discuss the Saiyan’s training. While the seer doesn’t want them to come to harm, Whis is hesitant to allow them to go Super Saiyan. They are almost on the verge of sensing a deity’s power and the “Super Saiyan boost” will only get in the way of their continual improvement. The next day of training commences and Whis instructs them to attack himself. Even after six months of training Vegeta hadn’t been given this opportunity before. But even with both of them working (or trying to work) together, they are too slow to even land a single punch. To improve their speed they need to go to the next level. This next level of training involves learning to have their bodies react without having to think about it. Thinking about your moves only slows you down. At the very end of the episode, we are introduced to a band of aliens taking about the “Freeza Force”. The alien spaceship is thrown off course by another new couple of aliens: “Lord Champa” and Vados. The mysterious duo have a conversation about searching for something and they destroy a planet to try and find it. However, whatever they were searching for was not to be found there and they move on as the episode ends. We have our first glimpses of the Resurrection ‘F’ movie with the appearance of the alien spaceship at the end of the episode. The interesting thing about that is Champa wasn’t in the movie at all but Champa plays a big part in the Dragon Ball Super saga following Resurrection ‘F’, the Universe 6 Saga. I’d be interested to see how much Champa’s story is interwoven throughout this saga (as I’ve pretty much forgotten what happens in these episodes). Despite the random potty humor at the beginning and end of the episode, I felt this was actually a very strong episode. I love seeing Goku and Vegeta work through their differences to become stronger. Vegeta’s stubborn prideful drive to become the best plays off Goku’s innocent drive to also be the best perfectly. There are a few storylines in the Dragon Ball universe that when they work, they really work. One is the training episodes, where characters are improving their skills and becoming stronger. Usually, when the characters are training though, they are actually training for a purpose; a tournament, a battle, or something of the sort. Here they are just training to train. And even without the driving storyline at this point in the story, I felt that everything worked perfectly.